Change Generation: Emily May, Executive Director, Hollaback! May talks to Fast Company about the growth of Hollaback!, the difficulties of trying to create major change in our culture, and what it’s like to be on a power list with Nancy Pelosi and Rachel Maddow. In 2005 Emily May heard a horrifying story of a woman who’d been sexually harassed in a subway, she was outraged and fed up with the unreported and under-discussed epidemic of street harassment, so she decided to do something about it. So she started Hollaback!–an organization that allows people to visually or textually share their experience of street harassment online. Today over 2,500 people have uploaded their stories to Hollaback! from around the world, and Emily, 29, now serves as the Executive Director. The service has launched iPhone and Droid apps, too. Emily talked to Fast Company about the growth of Hollaback!, the difficulties of trying to create major change in our culture, and what it’s like to be on a power list with Nancy Pelosi and Rachel Maddow. Hollaback! is a movement dedicated to ending street harassment using mobile technology, media advocacy, and policy. By collecting women and LGBTQ folks’ stories and pictures in a safe and share-able way with our mobile phone applications, Hollaback! is creating a crowd-sourced challenge to the status quo. It breaks the silence that has perpetuated sexual violence internationally, pronounces that any gender-based violence is unacceptable, and creates a world where we have an empowered response to street harassment. A woman named Thao Nguyen was riding the train into work when she saw a man masturbating in the train across from her. Thao took a picture and brought it to the police, but they didn’t do anything. She posted the picture on Flickr, and it quickly went viral and landed on the front cover of the Daily News. All of a sudden, the whole city was talking about public masturbation, and women everywhere were telling stories. After that, a group of friends (four woman and three men) were talking about street harassment, how pervasive it was, and how frustrating it is that we don’t have a response. We were inspired by Thao, and thought–what if we put pictures and stories of harassers up on a blog? Hollaback! was born, and Thao is one of our founding board members. Street harassment is one of the most pervasive forms of gender-based violence and one of the least legislated against. Comments from “You’d look good on me” to groping, flashing or assault, are a frightening and daily reality for women and LGBTQ individuals globally. But, it’s rarely reported, and it’s just culturally accepted as “the price you pay” for being a woman or being gay. At Hollaback!, we don’t buy it. When Good Morning America called, we thought, whoa. We’re onto something. But then a funny thing happened–it just didn’t stop being amazing. Having been an activist since I was 15, I’ve never seen a more blessed project. Each day brings a new, incredible milestone. I just feel lucky to be in the middle of it all. When I started Hollaback! I was getting street harassed three or four times a day. When I walked on, I felt weak. When I yelled at guys the situation escalated, and the police didn’t care. When I started to Hollaback!, I finally felt like I found what I was looking for: a response to street harassment that mattered. How did your goals change over time? And what’s your goal today? Once we realized the project was hitting a nerve, we realized that the power of Hollaback! wasn’t just in having a personal response–it was having a response that impacted the world. Today, our goal is to build a broad-based, international awareness to street harassment. This starts with people coming forward and telling their stories, but as the issue gains traction, we’ll be working more and more with legislators get the message out, through education and awareness campaigns, that street harassment is not okay. When I Hollaback, I Hollaback for me, but I also Hollaback for the world. I grew up in Richmond, Virginia. The strong conservative culture made life a world of contradictions for me. At the age of 12, I was president of the Future Homemaker’s of America at school. I also bought my first power-suit that year (an Amy Beyer original if you’re wondering), and wore it around the house daydreaming about becoming the first female CEO at PepsiCo. I didn’t understand the contradiction until much later in life. At 19, I was perhaps the world’s first punk rock debutante. It was hard work trying to get all that black hair dye out before the ball, but in the end it was a blast to meet so many incredible girls who had so little in common with me. Growing up in Richmond, you get up close and personal with ideas that you may not agree with, and you learn how to influence them. Still today, talking on conservative radio programs is one of my favorite parts of the job. Embracing these contractions is what makes Hollaback! tick. We are a sassy, fun, empowered response to very scary, isolating and silencing experience. We’re shifting culture, and we’re not leaving anyone behind. My mom is a high school librarian (a great one in fact, she was librarian of the year in the state of Virginia in 2008). My dad runs our family business, which was built by my great grandfather. It’s one of the few places left in the world where you can still buy a beer for $2. What college did you go to? Major/minor? Undergraduate, I went to NYU’s Gallatin School of Individualized Study. You get to design your own major, so mine was “Politics, Cultures, and Identities.” It was one of those majors where everyone was like “hmmmm … and what are you going to do with that?” But I couldn’t imagine a more perfect major for what I’m doing now. I got my Master’s degree in Social Policy from the London School of Economics. Mostly so that you’ll think I’m smart. But while I was there I also honed my inner-geek and passion for using data to make social change. Hollaback!’s mapping technology is a “mixivation” of sorts. It blends grassroots community organizing with technology and gives us a very happy byproduct: hard data. We’re working now to turn that data into a “State of the Streets” report that will give us a better understanding of street harassment so we can be strategic in our strategies to end it. When I graduated Kindergarten we had to take a test that would show what level class we should be in. I bombed it and spent first grade in remedial classes. In second grade (still in remedial classes) I had a teacher named Ms. Hogan. I was painfully shy, insecure, and convinced that I was dumb. Ms. Hogan was the first teacher that treated me like I was smart. It took me the rest of elementary school to make my way up into regular classes, but Ms. Hogan was the first one who believed in me. What figures do you most admire? Whose leadership model do you follow? Whom do you seek out for advice? Historically, I look to the visionaries who took on an issue that was unpopular, got slandered, name-called, and sometimes worse, but they kept fighting. They saw a world that didn’t exist yet. I think a lot about Martin Luther King. One of these days I’m going to get myself a WWMLKD? bracelet. I’ve been honored to know many brilliant, bold, fearless people. My mentors Margaret Stix, who now runs a company called Energy Answers, and Randy Peers, who runs Opportunities for a Better Tomorrow, gave me confidence, and showed me what I could achieve. My friend New York State Assemblyman Jim Brennan taught me to be guided by strong values and relentless in the belief that change is possible. The team at the Women’s Media Center taught me that my voice matters. But of course, no list of brilliant, bold, fearless people is complete without mom. She taught me it was OK to be me. When I was scared, she was strong. When I thought I was dumb, she told me I was smart. And when everyone else told me I was a nut (“you’re leaving your job completely unfunded to run Hollaback! full time?! ?”), she told me she trusted me. If everyone in the world had a mom like my mom, the world would be a really awesome place. How is your life different now than it was before you started this project? When you are doing exactly what you are supposed to be doing, everything just falls into place. Hollaback! is a blessed project, it always has been. Now we’re in 10 cities internationally, growing to another 15 within the next few months. We’re hearing stories of harassment from girls as young as five. I’m talking on MSNBC and to The New York Times about this issue. I’ve got a team of 20 “freelance badasses” (they prefer not to be called volunteers) that work overtime to bring this project together. The Women’s Media Center named me one of “30 Women Making History” along with Rachel Maddow and Nancy Pelosi. Um, wow. But it’s not all roses and tea cups. We’ve got challenges too, and the biggest one is funding. I’m regularly working 14-16 hour days to make this happen, and there are no other full-time staff. Hollaback! is an out-of-the-box idea, and in the recession, out-of-the-box funders are harder to come by. We are primarily supported by young people making $5 and $10 donations, and volunteers generously giving their time. This is a beautiful thing, but if we can’t raise additional funds quickly we will have to slow this groundswell of energy. Yes, this is the part of the interview where I tell you to donate. Go to ihollaback.org, make a gift, and be our hero. The world will thank you. I hear cheering in the background already. The Internet speeds everything up. I’m excited to see how my generation will use the Internet to speed up social change, too. I’ve been inspired by groups like Feministing, who engaged the on-line feminist community is a big way, or Ushahidi, that launched a crisis mapping platform. And of course the very smart Harassmap that’s tracking street harassment in Egypt. This is just the beginning. I’d ask him how he got to be so darn good at inspiring people to do things that are scary (like change). The explosion of mobile technology has given us an unprecedented opportunity to end street harassment, and with it, the chance to take on one of the final new frontiers for women’s rights around the word. The Hollaback! 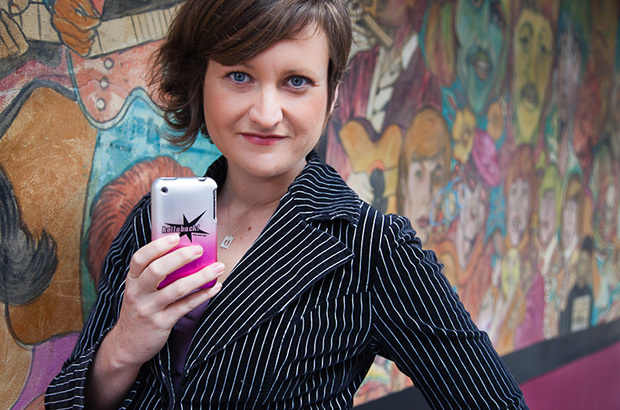 iPhone and Droid apps create a safe, immediate, and action-oriented response to street harassment, transforming girls, women, and LGBTQ folks into open-source activists with the touch of a button. Each Hollaback! story will be mapped and submitted with an optional photo, putting a face on the everyday harassment and assault. Mobile technology and the Internet have given us a new campfire. And it’s no longer a battle over who speaks the loudest, but rather who speaks. The Internet, combined with mobile technology, is giving us a way to document day-to-day discrimination like street harassment like never before. It’s with us every time we need a response, and it allows our voices to be heard worldwide. If that’s not a recipe for change I don’t know what is. I’ve got to change a culture that makes gender-based violence. That’s a serious job. But guess what, culture changes. In the past 60 years we have gone from a culture where people of color drink out of different water foundations, to a culture where we have our first black president. Now, we’ve got get the culture of gender-based violence on the same trajectory. Being young isn’t easy. And being a young woman is even harder. But it’s never been a better time to be either. I think my generation is eagerly embracing that, and fearlessly being the badasses that too many generations before us never had the opportunity to be. I want all the little baby girls riding around in strollers today to never have to experience street harassment the way that we have. I want them to be able to say good morning to the guy on the corner without fear that it will escalate. I want them to be able to walk down the street, their thoughts interrupted only by traffic and shop windows. And ultimately, I want them to take my work for granted. Still coming up with creative solutions to poverty. I loved that job, but I love this one more. Don’t just walk on … Hollaback! Follow Hollaback! on twitter @ihollaback.